cascade that leads to phosphatase-mediated (e.g., PP1B) dephosphorylation of P-catenin and enhanced postsynaptic recruitment of P-catenin itself, cadherin, and PSD-9 5 68. Finally, PSD-95 itself is under negative control of the cyclin-dependent kinase 5 (cdk5), which is a cell cycle-dependent kinase that downregulates postsynaptic PSD-95 accumulation69. Thus, cdk5-dependent serine/threonine phosphorylation of PSD-95 might constitute another negative regulatory element that restrains the development of glutamatergic synapses. It is well recognized that the postsynaptic localization of neurotransmitter receptors is controlled by serine/threonine phosphorylation. For example, MAPK activation stimulates both the postsynaptic recruitment of PSD-95 (see above) and of AMPAR GluR145. The recruitment of AMPARs to postsynaptic domains that previously contained solely NMDARs implies a means for the conversion of so-called silent synapses into functional ones and for long-term potentiation (LTP) of glutamatergic synaptic transmission. 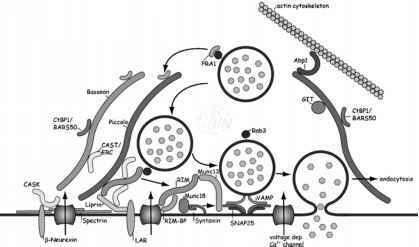 LTP is considered as the cellular basis for some types of learning and memory, and the induction of LTP requires the coincidence of synaptic activity and an adequately strong postsynaptic depolarization. The molecular basis for coincidence detection involves NMDAR-mediated Ca2+ influx and CaMKIIa activation. CaMKII probably is the most intensively studied kinase and therefore merits a detailed discussion here (Figure 21.3). Ca2+/calmodulin binding to CaMKIIa activates CaMKIIa by relief of the kinase domain from association with its autoinhibitory domain. As a consequence, activated CaMKIIa phosphorylates position T286, which renders the kinase domain to be less Ca2+-dependent. This involves phosphorylation-dependent conformational alterations, which increase the affinity of Ca2+/calmodulin for CaMKIIa in order to prevent the autoinhibitory CaMKIIa domain to associate with, and to inhibit, the kinase domain70,71. In this way, sufficient amounts of phospho-CaMKIIa can be maintained even under basal intracellular Ca2+ levels, which guarantees a long-lasting CaMKIIa signaling beyond the induction of LTP (Figure 21.3A). CaMKIIa is therefore considered to be among the "memory molecules" that encode the intensity of synaptic usage72. However, considering the presence of protein phosphatases (PP1 or PP2A) and, of course, constitutive protein turnover, the question arises as to how this long-lasting CaMKIIa activity is actually maintained. The following considerations outline another principle of function of intracellular signaling networks. As for the establishment of synaptic contacts, intracellular signaling components must be held in close spatial proximity to each other in order to meet and exert their enzymatic activities. Within postsynaptic glutamatergic densities, this is the case for NMDARs, AMPARs, CaMKII, and also PP1. During the so-called "on state," the CaMKIIa phosphorylation rate dominates over PP1 enzymatic activity because PP1 is confined to postsynaptic densities where the enormous amounts of phospho-CaMKIIa, which reaches concentrations of up to 200 p.M, saturate PP1. Before the CaMKIIa on state is attained, the enzymatic rate of PP1 predominates over the kinase rate so that CaMKIIa remains largely dephosphorylated (Figure 21.3A, offstate). If PP1 was not trapped within this separate enzymatic compartment of the postsynaptic density, as is the case for PP2A, the on-off-switch working mode of CaMKIIa would not be guaranteed73. Postsynaptic CaMKIIa activity might also be limited by restraining the access of Ca2+/calmodulin, which leads to autophosphorylation of T305/306 (Figure 21.3A) and dislocation of CaMKIIa from postsynaptic sites74. This highlights once again that a tight regulation of the spatial and temporal aspects of kinase and phosphatase activities is indispensable for adequate neuron physiology. As mentioned above, AMPARs and NMDARs are integral parts of the glutamatergic postsynaptic density. CaMKII-mediated phosphorylation of AMPARs is known to increase the unitary AMPAR channel conductances75, which strengthens glutamatergic synaptic transmission. Furthermore, the recruitment of AMPARs to postsynaptic densities is enhanced by CaMKII phosphorylation and this ensures a long-lasting enhancement of postsynaptic responses76. However, as AMPAR phosphorylation by CaMKII is not necessarily associated with enhanced AMPAR recruitment to postsynaptic densities77, the question arises as to how CaMKII signaling and enhanced postsynaptic AMPAR delivery may be achieved. A likely answer to this question is given in a model proposed by Lisman73, where active (i.e., phosphorylated) CaMKIIa binds a-actinin, which interacts with actin, which binds the actin-binding protein 4.1, which in its turn is known to bind to synapse-associated protein of 97 kDa (SAP-97), the postsynaptic anchor protein for GluR1 subunit-containing AMPARs (Figure 21.3B). The fact that phosphorylation of CaMKIIa enhances its association with the actin cytoskeleton ensures efficient postsynaptic CaMKIIa recruitment, which is required for saturation of PP1 (see above) and, hence, long-lasting CaMKIIa activity. In synergy with this, CaMKIIa phosphorylates SAP-97 (Figure 21.3B) and drives S39-phosphorylated SAP-97 into spines where it contributes to GluR1 anchoring78. Moreover, CaMKIIa can bind to two distinct residues within the NMDAR 2B subunit. By mimicking a segment of the CaMKIIa autoinhibitory domain, NMDAR 2B binding to CaMKIIa generates an autonomous and Ca2+/calmodulin trapping state of CaMKIIa that cannot be reversed by phosphatases (Ca2+/calmodulin-regulated NMDAR-CaMKIIa interaction)79 and does no longer require Ca2+/calmodulin binding (Figure 21.3A). This conformation also prevents CaMKIIa from inhibitory autophosphorylation at T305/306. The second CaMKIIa binding site is phosphorylation regulated and requires both the NMDAR and CaMKIIa to be phosphorylated79. These mechanisms add another dimension to the on-off-switch working mode for CaMKIIa because the postsynaptic recruitment of CaMKIIa activity relies on several distinct, but synergistic, mechanisms, including (1) the classical Ca2+- and phosphorylation-dependent mechanism of CaMKIIa recruitment to postsynaptic sites, (2) confinement of enzymatic activities causing phosphatase saturation, and (3) complete autonomy of CaMKIIa by conformational means upon NMDAR 2B binding. Thus, an intimate linkage between active CaMKIIa, NMDARs, and AMPARs at postsynaptic sites is established during, and required for, LTP. CaMKIIP, however, which contains an additional short actin-binding sequence as compared to CaMKIIa, is capable of binding polymerized actin in the unphosphorylated state (Section 3.2). As mentioned before (Section 3.2), synaptic activity favors dissociation of CaMKIIP from actin. This implies that both CaMKIIa and CaMKIIP signaling translate synaptic activity in cellular responses, which stabilize the concerned glutamatergic synapse by means of enhanced receptor function (e.g., enhanced postsynaptic AMPAR delivery and channel conductance) and reduced cytoskeletal dynamics. Figure 21.3. CaMKIIa Mode of Action and Effector Mechanisms. (A) Complex interplay between CaMKIIa activation and deactivation cues. Ca2+/calmodulin binding to CaMKIIa leads to kinase activation by conformational means, i.e., the autoinhibitory domain ceases from the kinase domain, which autophosphorylates T286 residue ("on-state"). Saturation of PP1 activity due to sequestration of the kinase activity within the compartment of the postsynaptic density fraction favors a prolonged "on-state" working mode, which is relevant for learning and memory. Furthermore, T286 phosphorylation dramatically enhances the affinity of CaMKIIa to Ca2+/calmodulin, which implies that less Ca2+/calmodulin is required for prolonged kinase activity. Postsynaptic CaMKIIa activation can also be achieved in response to Ca2+/calmodulin binding and subsequent NMDAR 2B association with CaMKIIa, which stabilizes the kinase in the "on-state" conformation without a further need for Ca2+/calmodulin, comparable to T286 autophosphorylation. Limiting the amount of Ca2+/calmodulin, e.g., due to reduced synaptic usage, leads to dissociation of Ca2+/calmodulin from CaMKIIa and consequently autophosphorylation of T305/306 residues, which stabilizes the kinase in the "off state" conformation. (B) Consequences of CaMKIIa activation. Among other targets, which will not be discussed here, active CaMKIIa phosphorylates itself at T286, phosphorylates GluRl-containing AMPARs and SAP-97. SAP-97 phosphorylation at S39 promotes SAP-97 association with the postsynaptic density fraction and consequently provides more anchoring sites for NMDARs and AMPARs. In contrast, SAP-97 phosphorylation at S232 limits postsynaptic localization of NMDAR 2A subunits. GluR1 phosphorylation leads to increase in the AMPAR channel conductance. Enhancement of GluRl-containing AMPAR function is further achieved by sequential binding of phosphorylated CaMKIIa to a-actinin, actin, protein 4.1, and SAP-97. It emerges that NMDAR trafficking is also strongly dependent on PKA and PKC phosphorylation. Surface NMDARs are S890-, but not S896-phosphorylated. S896 phosphorylation, however, is required for relief of NMDARs from retention within the endoplasmatic reticulum and, hence, increases their delivery to the cell surface. Once sorted into the exocytotic pathway, S896 is rapidly dephosphorylated. S890 and S896 are phosphorylation targets of PKC a and P, and PKC y, respectively80. However, the serine residue S897 is selectively phosphorylated by PKA, and this enhances postsynaptic NMDAR recruitment81. PKA further contributes to strengthening of glutamatergic synapses by phosphorylation of AMPARs, which increases their channel peak open probability82. The fact that distinct protein kinases and furthermore distinct PKC isoforms mediate selective phosphorylations of AMPARs and NMDAR residues S890, S896, and S897 emphasizes once more the profound physiological relevance of individual phosphorylation target residues in the determination of kinase function. However, postsynaptic NMDAR recruitment is restrained by PKC phosphorylation, which probably serves to protect neurons from overexcitation and concomitant cell death by excitotoxicity83. Furthermore, this coincides in a functionally synergistic way with the reduced Ca2+ requirement for CaMKII activity. Thus, PKC and CaMKIIa act in a synergistic way with respect to NMDARs: PKC activation, for example in response to group I mGluR activation, leads to phosphorylation of the NMDAR 2A subunit, which consequently promotes NMDAR dissociation from CaMKIIa in postsynaptic densities84. Furthermore, NMDAR 2A recruitment to synapses is negatively regulated through CaMKIIa phosphorylation of SAP-97 at S23285. Thus, with respect to SAP-97, CaMKIIa exerts a dual effect on postsynaptic AMPAR and NMDAR recruitment. It enhances postsynaptic AMPAR recruitment and reduces postsynaptic NMDAR 2A accumulation by using two different phosphorylation sites within SAP-97 (Figure 21.3B). In addition to these serine/threonine phosphorylation-related mechanisms, tyrosine phosphorylation plays a crucial role in synapse formation. Activation of Src-kinase, which in its turn phosphorylates NMDAR at three tyrosine residues86, can be achieved in several ways, including PKC activation and ephrin signaling. With respect to ephrin signaling we know that ephrin-ligand to EphB2 engages Src-kinase, which leads to enhanced NMDAR-mediated Ca2+ influx. Thus, tyrosine phosphorylation of NMDARs renders neurons more sensitive to glutamate and might therefore represent an initial step in the assembly of the glutamatergic postsynaptic density. Moreover, by strengthening synaptic connections this mechanism might convert activity-independent cell adhesion cues into activity-dependent synaptic processes, such as LTP. However, as already mentioned (Section 3.2), binding per se of the extracellular EphB2 domain to NMDARs appears to be sufficient for the observed enhancement of NMDAR Ca2+ permeability47,87. In addition, EphB2 was found to bind to GRIP, the postsynaptic anchor protein for AMPARs. Thus, GRIP interaction with EphB2 triggers EphB2 clustering at postsynaptic sites, which enhances postsynaptic AMPAR recruitment and simultaneously, at presynaptic terminals, initiates reverse ephrin signaling that involves presynaptic PKA activation and enhancement of glutamate release88. Altogether, this reveals that in addition to their contribution to postsynaptic protein recruitment and to synapse formation, protein kinases are selectively associated with the control of several determinants of channel function and presynaptic neurotransmitter release. These complex, spatially and temporally highly intermingled molecular mechanisms orchestrate the functionally adequate maturation of pre- and postsynaptic proteomes. Once again, these insights emphasize the critical importance of phosphorylation hierarchies, confinement of enzymatic activities, and, down to an intramolecular level, of positioning enzymatic kinase activities to selected target residues within the proteins of interest.